This little tart is simple, but stunning. It’s got two comforting ingredients – custard and earl grey tea – but they look super classy, so you can munch on them in front of the tv on a lazy afternoon, or serve them with high tea… they look at home in any setting. 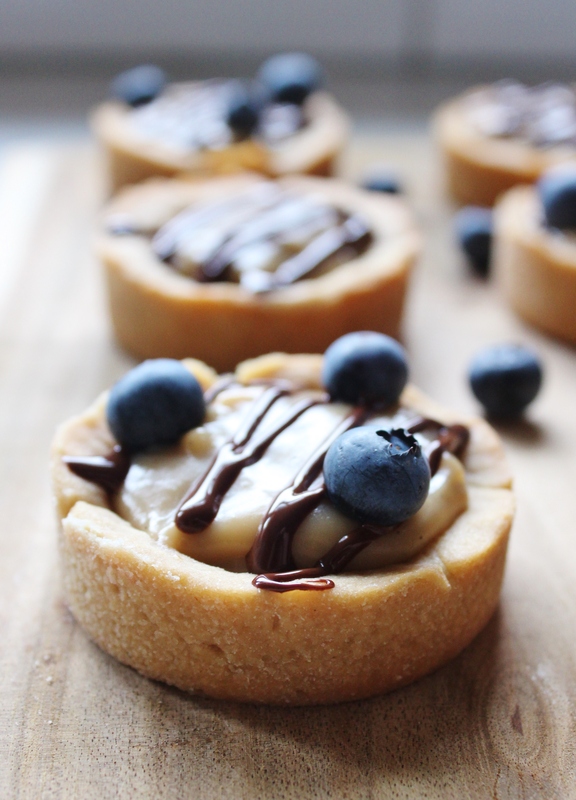 I have a hard time turning down desserts, but tarts hold a special place in my heart – especially mini tarts! There’s something about their dainty little cases, the way there’s always just enough mouthfuls, and how you can get away with gorgeously rich fillings because they’re so tiny. So much yum! I also loved how one of these tarts looked a bit like a face once I’d taken a bite out of it! 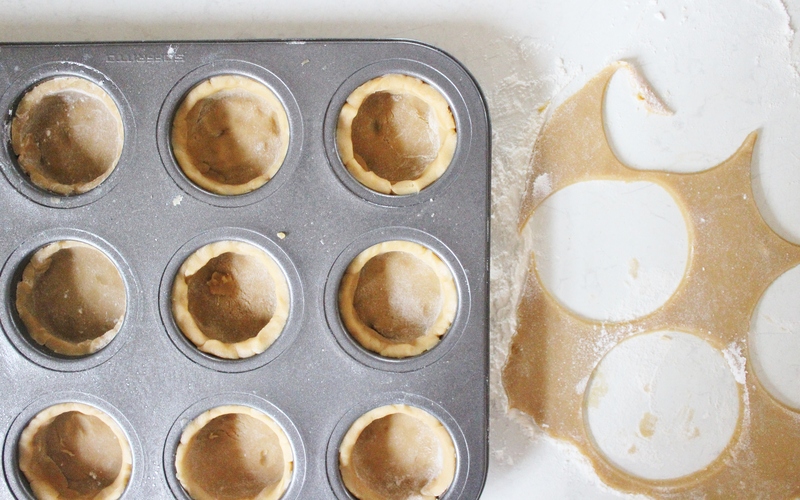 I’m starting to make that clear with my number of mini tart recipes. I loved the vanilla fig tarts that I made at Easter. And lime curd tarts arejust divine. Using your flat beater, mix together the butter, brown sugar and egg. Switch to your dough hook and add in the flour. Mix until combined, then form a ball with the dough, cover it in cling wrap and refrigerate. The dough is not going to be like a normal pastry dough, it will be soft and biscuity. Refrigerate for at least 20 mins. Grease a 12 cup capacity cupcake tin. Mine has removable bases, which makes it slightly easier, but you can use a regular cupcake tin. Roll out to ½ inch on a well-floured surface. Working quickly, cut out rounds of dough. Press the rounds into the greased tin and neaten up the edges with your fingers. The dough should be quite malleable, so creating an even top shouldn’t be hard. Prick each tart case with a fork a couple of times. Pop the dough in the fridge for ten minutes – don’t skip this part! The dough is very buttery, so needs this extra chilling time. While the dough is chilling, preheat the oven to 190°. Put the dough in the oven for 15-18 minutes. While the dough is in the fridge, start on your custard. Pour your milk into a heavy-bottomed saucepan. Cut the vanilla bean lengthways and scrape out the seeds. Put the seeds and pod into the milk. Place the milk over a medium heat and bring to the boil. When it has boiled, take it off the heat and pop the tea bags in to steep for 10 minutes. Mix the corn flour, sugar and egg yolks in a bowl until you have a nice orange paste and set to one side. Remove the vanilla bean from the milk and discard it. Scoop four tablespoons of the milk into the egg yolk mixture and mix well. Repeat twice more to temper the egg mixture. Pour the egg mixture in with the remaining milk and return to the stove on a medium heat for 12-15 minutes, whisking constantly. It should start to thicken around the 4-5 minute mark, but keep stirring. You want it to be still liquid, but quite thick. The mixture should lightly bubble away. In the last five minutes of cooking the custard, switch from your whisk to a wooden spoon and scrape down the sides and base of the pan so that nothing burns. Remove from the heat, stir in the butter and mix until incorporated, then allow to cool for five minutes. Scoop the warm custard into your tarts and smooth it out. Pop into the fridge for at least ten minutes, then garnish with 25g of melted dark chocolate and ¼ cup of blueberries. These look adorable and delicious. Love mini things to eat, reminds me of Bridget Jones Diary and the mum who made ‘mini’ everything. 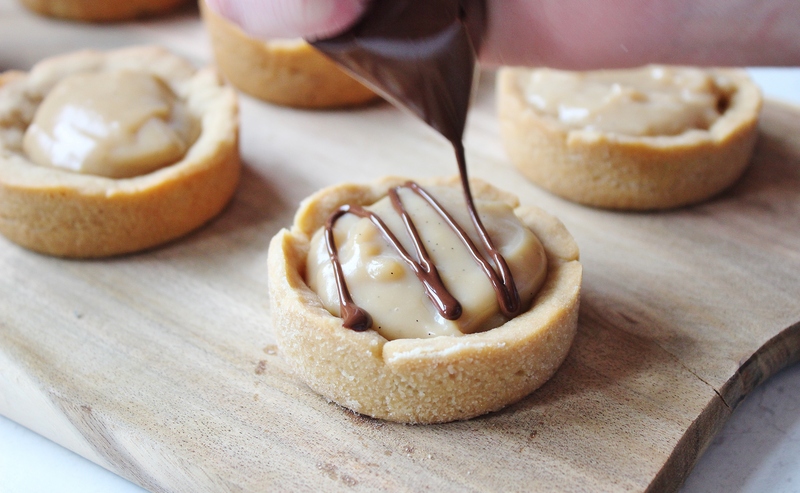 Oh I do too, love mini tarts. I do love your earl grey custard. 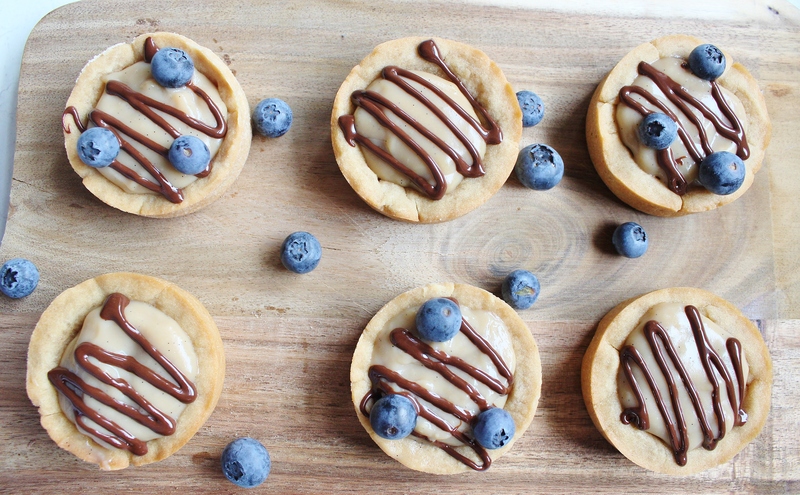 Those little tarts looks delicious. Thank you, Suzanne! I don’t know why I haven’t combined tea and custard before!! haha. such a wonderful treat – decadent and pretty.